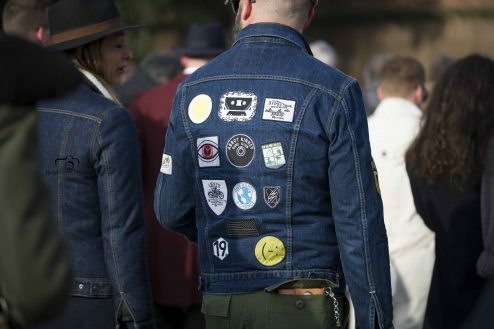 There are very few fashion trends that cross continents and generations, but denim is one of them. In particular denim jeans, it really does not matter where you go in the world you will see someone wearing them. This fact has been confirmed by global travellers and anthropologists that have spent time counting the number of passersby they see wearing denim, in particular jeans. Pretty much regardless of what country they are in, they find people wearing this iconic fabric. Denim shirts for men and women are also fashionable. They are once again widely available in Europe and North America. So, why is this fabric so globally popular, what made denim so ubiquitous? Well to understand how that has happened we need to look back in time. Arguments still rage about when denim was first manufactured, but one thing practically all researchers agree on is that it was made as a workwear fabric. The first pair of rivet reinforced jeans was made in 1873 by Jacob W Davis, who lived and worked in Nevada, USA. Jeans are tough, hard wearing and comfortable. As a result, they soon became part of worker´s uniforms in North America and large areas of Europe. For well over seventy years, that is where denim was worn, in the workplace. However, that all changed in the 1950s.When Marlon Brando wore them in ´The Wild One´ and James Dean sported a pair in ´Rebel Without a Cause´, in the mid-fifties, wearing jeans became a symbol of rebellion. Teenagers started to buy them to wear casually. Eventually, their parents did too. By the 1970s, wearing denim was the norm in many developed countries. As a result, in other parts of the world, especially in developing nations wearing jeans became desirable. In places where they were still not widely available, they were prohibitively expensive for most sections of the population to wear. As a result, they started to become an aspirational item of clothing. Owning a pair of jeans, especially a branded pair, was a sign you were doing well. Over time, prices fell, as they always do in markets where there is a huge pool of potential buyers. In addition, the fact that they were durable and hard wearing meant that just one pair could potentially be worn for decades. All of these factors combined to finally bring jeans to the masses and further enhance their popularity. During the 60s designers started to experiment with new looks, changing the cut, adding embroidery and other enhancements. By the 70s, different washes and even colours started to be used. The late 80s brought us distressed denim, and the late 90s stretch versions of this iconic fabric. Even today, designers continue to find ways to innovate to keep denim relevant for each new generation. The development of new printing techniques is producing a whole new denim look, for today´s consumers to enjoy. If you would like to read more about why denim has taken the world by storm, and how it is likely to be used in the future. Just click this link. There you can read the research that the University College London (UCL) has pulled together as part of its Global Denim project.